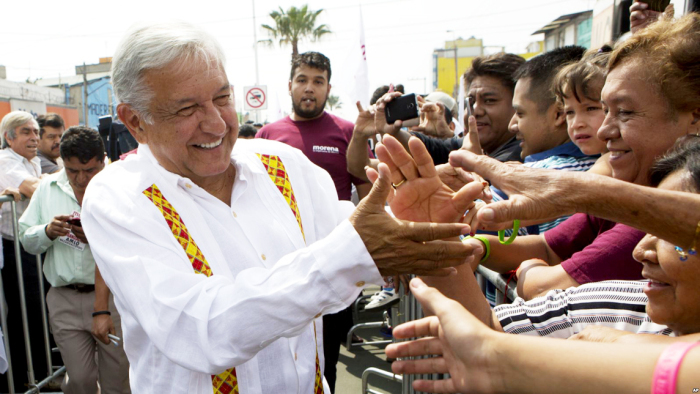 the Northern Worker: Where is Mexico Heading with Lopez Obrador? Two days after the elections in which he had tied a sweeping victory with more than 50 percent of the total vote, Andrés Manuel López Obrador (AMLO) announced that he will back the government of Enrique Peña Nieto during the transition period prior to the rise of the new government. This declaration culminated months of negotiations and agreements that allowed election day, July 1, to unfold relatively free of any upsets. Those who still have the illusion that López Obrador will lead a great process to push back neoliberalism in Mexico have not paid attention to what his leadership has been repeating for years, and very clearly, as he did in his statement, “I will not change the economy” (El Universal, April 13, 2012), during his previous presidential campaign—a statement he has never denied since. However, there has certainly been a change in the public image of the National Regeneration Movement (MORENA)—the party that AMLO founded and directs—due to the presence and radical tone of the leftist intellectuals who belong to the party. Surely, the above is being justified with the famous phrase that “Paris is worth a mass.”* We’ll see what they tell us later; but for the moment the only possible interpretation is that these intellectuals have stepped aside to facilitate the negotiations and agreements reached by AMLO and Romo with the government of Peña Nieto and with the business groups. As things stand, however, there is no doubt that the huge popular discontent against the Peña Nieto government and the disenchantment with the vast majority of politicians made its way irrepressibly with the vote of over 50% for the candidacy of AMLO. The population, and especially the sectors that have suffered from inequality and injustice, have felt its strength. Their protest by voting has severely damaged the PRI and the PAN, and left the PRD moribund. What we might call the “party system” has suffered a defeat that will require a profound reconfiguration—which will imply not only changes in the platforms and in the image of the parties that we have just mentioned but the emergence of new organizations. Paradoxically, MORENA will have to face the greatest challenges. Not only does it have a very weak structure, but the influx of leaders and members of other parties without more identification and cohesion than their support for the caudillo who has won the presidency of the republic means that it will be very difficult for him to control the enormous variety of interests that have lodged in its heart. Inevitably, the president of the republic will more often play the role of referee in disputes between the contending parties. To mention the case of one conflict that can be explosive: the teachers who voted for AMLO, most of whom are organized, are anxiously waiting for the rise of the new government to mean the end of the “educational reform” imposed by the government of Peña Nieto. How much will they be granted? Surely the powerful entrepreneurs, who hold the economic power in Mexico, will not agree with the demands of the teachers, and will do everything possible to hinder them, or to block them altogether. In other words, it is a conflict between the interests of opposing social classes, and any conciliatory attempt will only result in short-term solutions. We can say the same thing of so many other unresolved conflicts, in which that 50 percent of the voters who voted for AMLO represent interests that are opposed to those of the capitalists who have chosen not to hinder the arrival of the caudillo to the presidency. Likewise, there is the opposition of very important sectors of the population to the “energy reform,” as shown by the outbreaks of dissatisfaction with increases in the price of gasoline; and there is also the conflict over the concessions granted to mining companies, as well as the new issue of concessions for the use of water resources. And it is not going to be enough for the new government to launch scholarship or support programs for the less favored social sectors. The mentioned conflicts will deepen. Social conflicts are also present around the right of women to abort an unwanted pregnancy, in safe conditions and under the best possible medical care. This demand is totally absent from MORENA’s program and proposals, but it is being raised by an increasing number of women. And what about the rights of homosexual communities, and of other people oppressed by their orientation or sexual preferences (LGBTQ+). The demands of these communities were absent during the electoral campaign. The contrast between the overwhelming joy displayed by millions of Mexicans and Mexicans who voted for AMLO and the concern expressed at the same time when everyone realizes that “now begins the difficult” is evident. And they are quite correct. Mexico is going through a crisis in public safety, and it suffers from very serious vulnerabilities and challenges in terms of economy (a colossal growth of the public debt), of the environment, of major social problems derived from the deep crisis in which the country is bogged down. That is not to mention the tremendous pressures of the powerful neighbor to the north, which with the Trump government has hampered negotiations on the North American Free Trade Agreement and put huge tariffs on foreign trade. Surely, the government that will take office next December will announce a series of plans; but judging by the proposals presented by MORENA and AMLO himself during the electoral campaign, there is no structured strategy to deal with the acute challenges that threaten the country—much less to address the complicated international situation. All of this means that, except for limited measures that serve to project an image of concern for the poor, the incoming government will remain on track in the policies dictated by the great capitalist interests, both national and foreign. This harsh reality is going to be revealed to the majority of the population as the new government takes its course. And revolutionary socialists will be ready to fight alongside the dispossessed and the oppressed, to forge from today the anti-capitalist strategy—democratic strategy and independent—that is necessary to achieve the triumph of the workers of Mexico. This revolutionary and socialist strategy will reclaim the best traditions of struggle of our people and unite it with the international emancipatory and libertarian struggle of the peoples of Latin America and of the whole world. * “Paris is worth a mass.” The apocryphal statement is attributed to King Henry IV of France in 1593. Henry was a Hugenot, and the statement indicated that he would not mind converting to Catholicism if by doing so he could attain power over the country. >> The statement above was issued by the Liga de Unidad Socialista, Socialist Action's sister group in Mexico.